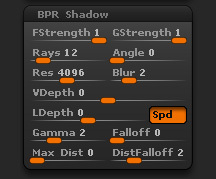 The BPR Shadow sub-palette controls how shadows are rendered with a Best Preview Render. The Floor Shadow Strength slider sets the strength for shadows cast on the floor; higher values give a stronger shadow. For shadows to appear on the floor the Floor Grid must be activated. The Global shadow Strength slider allows you to adjust the amount of shadow being applied to your entire model without needing to change the Material > Environment >Shadow slider settings separately for each material used. A higher value gives a stronger shadow. Keep in mind that this slider is an exponent to all Material > Environment > Shadow slider settings so that you can adjust that value separately for various materials to fine tune the shadows as necessary. For example, if one of your materials’ Environment Shadow is set at 100 but then you move the Global Shadow Strength to 0.50 then only 50% of the 100 value will be used on the material. The Rays slider will set the number of rays used in the shadows calculation. A higher number will give softer shadows, depending on the Angle setting. Increasing ray number will increase render time. The Angle slider will set the maximum angle through which the rays are generated: Higher values give softer, less focused shadows. A setting of 360 with a high number of rays will give an effect close to ambient occlusion. The Res slider will set the shadow resolution in pixels: This figure is effectively the image size (independent of document size) that ZBrush uses internally to calculate the shadows. Lower settings will render more quickly, higher settings will give greater accuracy. Sometimes a lower value can give the desired result with less processing overhead – for example, when soft shadows are required. The Blur slider will set – shadow blur radius in pixels: Higher values give softer, more blurred shadows. This is related to the Res slider and should be adjusted in tandem for the same effect. For example, if the Res slider value is changed from 500 to 1000, a Blur value of 4 should also be doubled to 8. The VDepth slider will set view depth offset in pixels: The shadow calculation is offset towards (with negative values) or away from (with positive values) the viewer. Negative settings can increase the intensity of the light and the shadows; positive values create more over all shadow. The LDepth slider will light depth offset in pixels: The shadow calculation is offset towards (with negative values) or away from (with positive values) the light source. Negative settings can increase the intensity of the light and the shadows; positive values create more over all shadow. Activates Sub-Pixel-Depth Calculations. Gives greater shadow accuracy. Normally left on but turning off will speed up render times when experimenting. The Gamma slider affects the shadow contrast gradient. A low setting will tend to give a shadow that extends over more of the model, a higher setting will be more compact. The shadow Falloff slider. Used in conjunction with the Gamma slider, the best results are obtained with a Gamma setting of less than 1. The Maximum Distance slider controls how far shadows stretch. A higher value gives longer shadows with a setting of 10 giving the longest shadows The default setting of 0 disables this option – shadows will be at their longest. The Distance Falloff slider controls the falloff for the shadows when Max Dist is turned up. With a low value the shadows will fade gradually, with a high value the shadows will fade more quickly.